We have seen this fad a lot in the last year or so and thought we would give you a few tips if it�s something that you would like to try. These are rustic & snazzy looking succulent planters, and so easy to make. Remember garden pottery will come in many sizes and styles and each one will be unique and original. Finding different items that can be used as a plant pot is fun. Start with a piece of driftwood. They come in many sizes and shapes so find a piece that will fit where you want to display it. If you are lucky and live by the beach, take a stroll and see if you can find something that will meet your needs. If you can find a piece that has a natural hole already in it then great, if not that you will have to make a center opening that you can fill with the succulents. 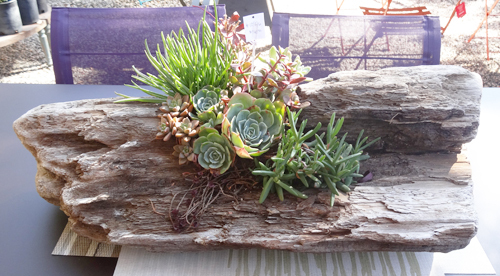 Next, select the succulents that you will use to fill the hole in the driftwood planter with. If it�s going to be displayed outside then find succulents that like the cold. Next fill the hole with moss to lay down a foundation for the plants. You can use hot glue to hold it down if necessary. 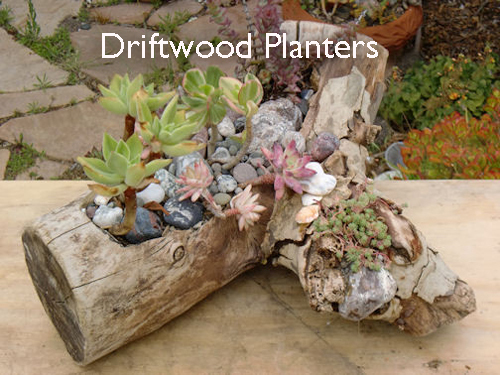 Then start adding your plants to create your perfectly unique driftwood planter. Pack them in tight so they will all help to hold them in place. Once they settle in and start to grow they will fill in the holes naturally. Once you get the look that you desire let the planter sit for a day before watering. Now water away and make sure the moss and root system of the succulents are moist. Because it�s pretty fragile and shallow you will have to water more often than you would with a garden pot. Keep on loving this decorative succulent planter and it will last for quite some time. Read more..... Clay Pot Irrigation. Read more..... Decorate with these fall materials.